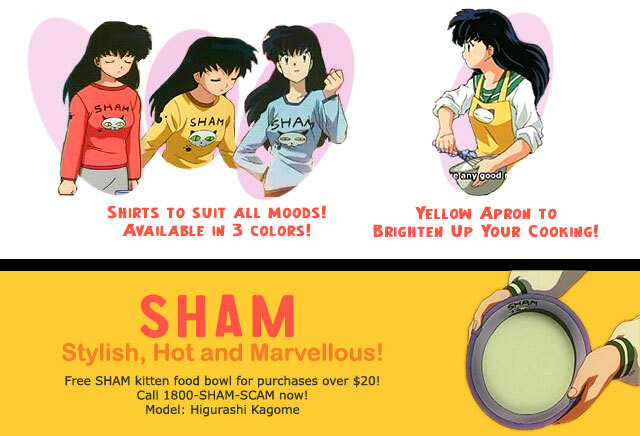 SHAM's product placement in Inuyasha, featuring our favourite model. Red and yellow shirts taken from EP38: Two Hearts, One Mind. Blue shirt taken from EP90: Sota’s Brave Confession of Love. Yellow apron taken from EP127: Don’t Boil! Horror of the Dried Demons. Also seen in EP135: The Last Banquet of Miroku’s Master. Kitten food bowl taken from EP97: Kirara Who Doesn’t Return.